Today is the Feast of St. Benedict the founder of Western Monasticism and the patron of all Benedictine Monasteries and Communities around the world. Here at the Monastery in St. Otillien preparations are being made all week for the annual “Benediktusfest”, to be celebrated on Sunday over the weekend. There are many activities, some religious, and other social. 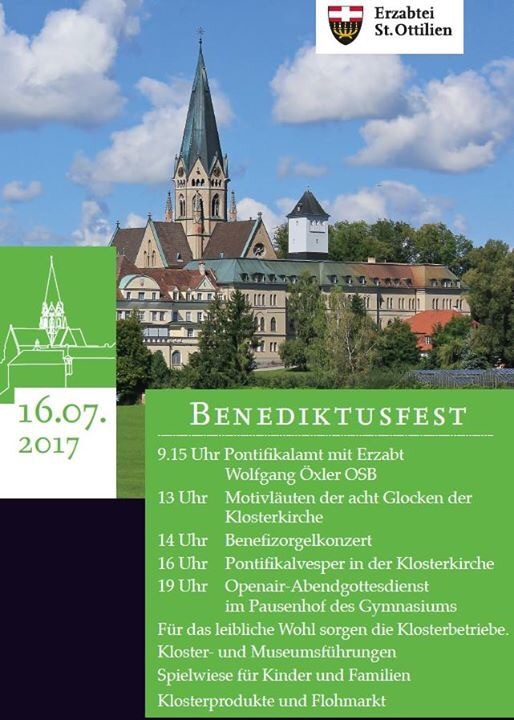 There will be beer, Bavarian bratwurst, music, an Organ Concert and a Bell Concert with the 9 monastery bells that ring daily. There will be an outdoor mass and Solemn Pontifical Vespers to end the celebration on Sunday. St. Benedict should be pleased. Despite the party, most of the time the Monastery is a place for quiet and prayer. The fact that it secluded and is separate from city life and in a rural setting helps greatly. At the same time, there are many monasteries and religious communities springing up in the heart of major cities. This is the whole focus for example of the Jerusalem Community which already has some dozen monasteries in the heart of various cities in Europe to be a “spiritual presence in the heart of the city.” It is my dream, with the help of others, and your prayers, to begin an Ecumenical Benedictine Community in the heart of Mexico City, when I return for good at the end of this year. It makes no difference whether we are monks or not, or professed in a religious community, ALL christian people need a space outside of chapels and churches to pray daily. Many cultures have built in the idea of a sacred space in one’s house. Most orthodox homes have an Iconostasis where there is perpetually lit a lamp in front of one or two icons where people say prayers daily. In Mexico and most of Latin America people have “home altars” in their homes with pictures of saints, their loved ones, candles, and flowers, where they can pray in the morning and in the evening asking for protection, guidance and assistance throughout the day. Sadly, much of Western Christianity has become so cerebral (in the mind) that people shun or avoid any external expression of religious life. This of course has never been so in the East either Christian or other, such as Buddhism. Finding a sacred space where you can go and sit and be quiet and light a candle and say prayers is essential I believe to modern living of the christian life. I do not think one should be without this amenity. Dispersed communities like ourselves rely and depend upon our own “cells” that we create in our homes. For us, our Homes are our Monasteries and Cloisters. They are our enclosures where we find God daily in the recital of the Daily Office, in Meditation, in Prayer, and in the Reading of Sacred Scripture. We may be surrounded by our beloved Pets, our our loved ones at home, or sit quietly with coffee or tea in hand, which is different from other monastic settings but we are in our cells, praying daily and faithfully with lifted hands and hearts. Our author reminds us all of the importance of our own private cell or sacred space for our spiritual well being. “A spirituality of the cell will be based not only on the human need for privacy and solitude but also on the faithful conviction that God is truly present in the monastic cell…..Thomas a Kempis wrote, ‘Shut yourself in, and call the well-loved presence of Jesus to your side; let him share your cell with you; nowhere else will you find such peace.’” My own sacred space in my apartment is the most loved space that I know. IT is where I bring my whole self daily before God. IT is where I can be vulnerable and open to God. IT is where I intercede on behalf of family, friends, parishioners, diocese, the Universal Church, and the world at large. It where one can truly “be still and know that I am God”…as the Psalmist says. I cannot imagine a normal day without my time sitting in my sacred space. This has been my practice since I was in Jr. Highs School where I would decorate a corner of my room with religious motifs depending upon the time of the liturgical year. I spent many hours alone living and creating that space as a young teenager. Even now, I make nearly daily changes in my sacred space depending upon the feast, or season, celebrated. Sundays and Feast Days always mean adding a few candles during prayer. Ordinary Time means creating a simple and more empty space to pray. Since the “secular monastic” or “dispersed monastic” does not have a common space to share with other monks to pray and sing, they must rely on these very personal sacred spaces to be in touch with the sacred. Even Thomas Merton, the great Monastic of our times at some point found the need for his own very personal space. *He petitioned the Monastery for a “hermitage” where he could celebrate mass daily and say much of the daily office alone, study and of course write the many books that he wrote in his lifetime. It was his oasis in the desert.